A slice of rustic island nature, complete with a free-roaming bull, is now open to the public, and there is no need for a boat to get there. Coney Island Park is located on the 50ha offshore Coney Island, which is connected to the mainland by two bridges on its western and eastern ends to Punggol Promenade and Pasir Ris Coast Industrial Park 6. The park was officially opened by Coordinating Minister for Infrastructure and Minister for Transport Khaw Boon Wan. 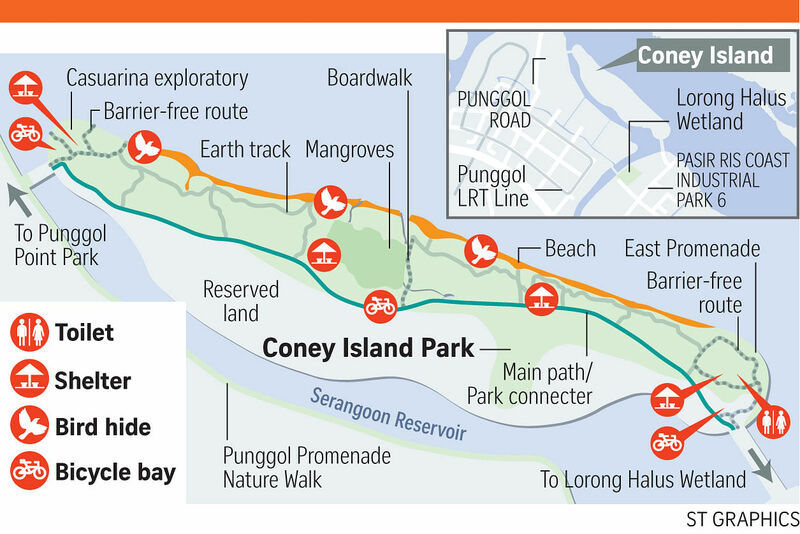 It features a beach that stretches 2km and a 2.4 km-long path that is part of the park connector network, which cyclists can use to travel between Pasir Ris and Punggol. Keen-eyed visitors may also encounter many different types of plants and animals there – the park is home to 86 tree species and at least 157 animal species, including nationally threatened species such as the spotted wood owl and the rusty-breasted cuckoo. Luckier visitors may even come across the single Brahman bull that roams freely across the island. The history of the island, also known as Pulau Serangoon, dates back to the 1930s, when it was bought over by the Haw Par brothers – Aw Boon Haw and Aw Boon Par, who built a beach villa there. The villa fell into disrepair after World War II and the island remained uninhabited until 1950, when Indian businessman Ghulam Mahmood bought the island with the intention to turn it into a resort. He named it after the Coney Island amusement park in New York, but his plans never materialised after he was fined for corruption. Coney Island Park is open from 7am to 7pm daily. The park is open only during the day as there is no lighting in the park after dark. Guided walks are also available here.